I am Therefore iPad: Do you hate your iPad? Of Course Not! 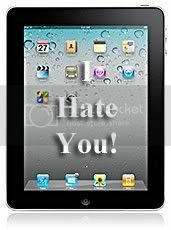 Do you hate your iPad? A have a Google Alert that provides me with a list of IPad relates stories to read daily. The other day I was intrigued by this headline on Slate.com: "I Hate My iPad." The article, by John Swansburg, said that he felt he didn't improve his life with his $600 investment. In fact, he said that spending his money on a salad spinner would have been more productive. Wow, and he even admitted that he hated salad. Digging a little deeper, the author admits the iPad is nice for browsing the web, but he likes the Kindle more for reading books because of the sharp e-ink screen. He hates typing on the iPad and generally doesn't think it is a big enough improvement over his laptop to justify the additional expense. Fair enough. Reading the piece forced me to think about my own iPad purchase. However, I came to opposite conclusions. At home, the iPad has pretty much replaced my laptop for email and web surfing, and I do some heavy-duty control via Logmein Ignition or TeamViewer of some other computers in the house, even when I'm not home. Continue reading "Do you hate your iPad?"